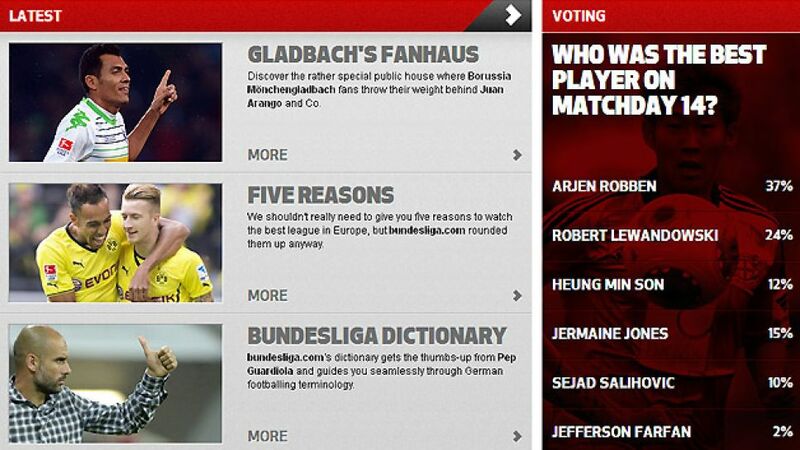 Munich - FC Bayern München’s emerged as the standout winner of bundesliga.com's Player of Matchday 14 vote. The Dutch international continued his prolific goalscoring form by adding another brace in the 2-0 win over bottom club Eintracht Braunschweig, helping the club remain top of the league and make it 39 games unbeaten in the Bundesliga. Robben received an impressive 37 per cent of the Matchday poll, a just reward for the 29-year-old's efforts against die Löwen. After finding the net for the 50th and 51st time in 90 league matches on Saturday, Robben now has the fourth best goals-to-minutes ratio in Bundesliga history, with a goal every 125 minutes. The former Chelsea FC and Real Madrid CF man wasn't the only player to score a brace on Matchday 14, though. After 1. FSV Mainz 05's Maxim Choupo-Moting converted a 74th-minute penalty against Borussia Dortmund, it looked as though BVB might fall further behind Bayern in the race for the Bundesliga title. However, Robert Lewandowski fired home two spot-kicks of his own to seal a 3-1 victory for Jürgen Klopp's team and earn himself 24 per cent of the vote. In third place, with 15 per cent, was FC Schalke 04 midfielder Jermaine Jones. The USA international's long-range strike completed a 3-0 win for the Royal Blues over VfB Stuttgart and a fine individual performance by the 32-year-old. Bayer 04 Leverkusen's South Korean star Heung Min Son finished just behind Jones with 12 per cent following his brace against lowly 1. FC Nürnberg. 1899 Hoffenheim midfielder Sejad Salihovic received 10 per cent of the poll for his two successful penalties in the thrilling 4-4 draw with SV Werder Bremen at the Wirsol Rhein-Neckar Arena, while Peruvian international Jefferson Farfan, who also scored twice in Schalke's win over Stuttgart, picked up two per cent.